Super Savings Item! Save 34% on the [2-Pack]18W Dual Head Timing Grow Lamp, 36 LED Chips with Red/Blue Spectrum for Indoor Plants, Adjustable Gooseneck, 3/6/12H Timer, 5 Dimmable Levels[AMAZINGCATS] by AMAZINGCATS at Outlet Shopping Guru. Hurry! Limited time offer. Offer valid only while supplies last. 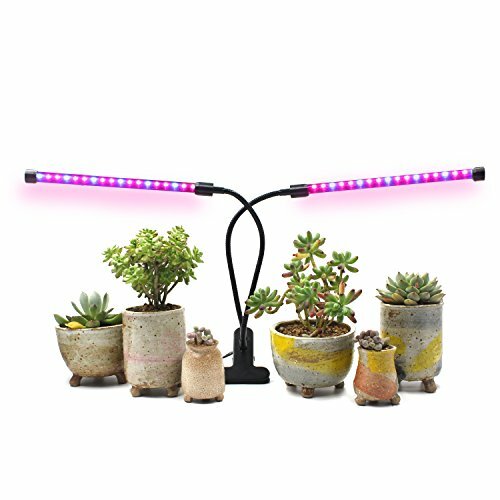 [Red/Blue LED] The LED grow light gives off targeted wavelengths (460nm and 660nm) for plants. 12 BLUE bulbs help plants with chlorophyll synthesis to intake more energy for better germination. 24 RED bulbs contribute to photosynthesis, germination, flowering and results. [Timer] Three options of timing setting up,3 hours, 6 hours or 12 hours according to plans need. [NOTE] This is ONE-WAY TIMER, the light can turn off automatically after 3/6/12 hours, and you need to turn it on manually. [Dimmable] 5 level dimmable of the brightness for different stage of plant growing. [Assembly] USB connector and stronger clip design apply to any place at your home or office. The input voltage to the USB Adapter should be 110-120V. Adjustable 360 degree gooseneck makes the light in any direction and can cover a larger areas and provide energy for more plants. If you have any questions about this product by AMAZINGCATS, contact us by completing and submitting the form below. If you are looking for a specif part number, please include it with your message. LED Plant Grow Light, Asundom Full Spectrum 100W Pro Aluminum Made Grow Lights with Daisy Chain for Hydroponic Indoor Plants Seeding, Germination & Flowering.